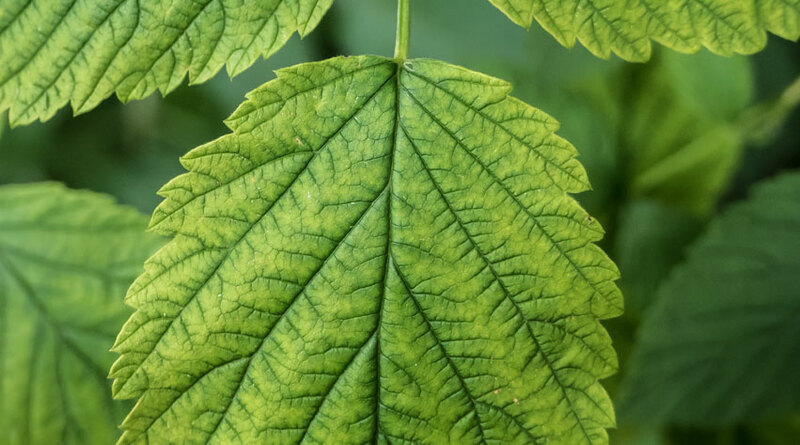 Magnesium deficiency is a plant disorder that causes the leaves to turn yellow between the veins, sometimes with reddish tints. It also results in early leaf fall. Magnesium (Mg) is one of the secondary macronutrients, needed by plants in relatively large amounts. It is important in leaf growth, photosynthesis (the process plants use to harness the sun’s energy to produce sugars and oxygen) and is present in chlorophyll (the light-absorbing plant pigment), so is important for deep green leaf colour. Magnesium deficiency normally starts on the older, lower leaves and then spreads to the younger leaves. Magnesium deficiency is caused when there are insufficient suitable magnesium-containing materials in the growing medium (soil or compost). It can also be caused when plants are growing in dry soil, which prevents the roots taking up the magnesium from the soil. Magnesium may be washed out of the soil or compost by excessive rainfall or overwatering, leading to a deficiency. Shortages are worse on light, sandy and chalky soils that drain quickly and contain little organic matter to hold on to the magnesium. Excessive use of high potash fertilisers (including tomato fertilisers) may lead to magnesium deficiency, since potassium is taken up by the roots in preference to magnesium. Keep soil magnesium levels topped up by feeding with a granular fertiliser that contains magnesium, such as Vitax Q4, especially in spring after winter rains may leach magnesium from the soil. Where soil levels are low, or plants are showing symptoms of leaf yellowing between the veins, feed with Epsom salts. Foliar feeding with Epsom salts is a good way to get magnesium into the plant quickly. Make sure soils contain lots of bulky organic matter to hold soil moisture and nutrients. This is particularly important on light, sandy and chalky soils, which drain quickly. Sowing green manure crops in summer or early autumn is particularly useful in vegetable gardens and allotments, or other areas of bare soil. These cover the soil over winter and help prevent nutrients, including magnesium, leaching out and are dug into the soil to improve fertility overall.